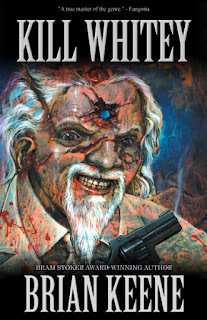 Larry Gibson, an employee of Globe Package Service, finds himself in trouble with the Russian mob, in particular one Zakhar “Whitey” Putin, a descendant of Rasputin with superhuman abilities. The Sons of the Constitution are mentioned. Whitey’s organization was at one time in competition with the Marano crime family; it’s mentioned Marano’s top guy, Tony Genova, disappeared some time before. Larry used to work with a guy named Sherm, who was killed in a botched bank robbery. Bathroom graffiti at the Odessa includes the name Kaine, as well as the phrase “Jesus saves, but Ob rulez.” The Kwan and Black Lodge are mentioned. Whitey’s group disposes of bodies in LeHorn’s Hollow. Whitey refers to himself as “Homo superior.” When police dredge Lake Pinchot for Whitey’s body, they instead find the body of a young girl murdered when her car broke down on an Interstate exit ramp. Globe Package Service is a branch of the Globe Corporation, which appears throughout Keene’s works. The Sons of the Constitution are a right-wing terrorist organization that has appeared most prominently in Keene’s novel Castaways. Tony Genova, an enforcer for the Marano crime family, appears across Keene’s multiverse, most notably in the Clickers series; the version here is the CU version, distinct from the Clickers-verse Tony. Sherm and the botched robbery are from Keene’s novel Terminal. Kaine is a name that turns up across Keene’s multiverse, in tales such as “Full of It,” “Two-Headed Alien Love Child,” and Clickers vs. Zombies. Ob is one of the Thirteen, and is the main villain of Keene’s The Rising series. The Kwan are an occult group from the works of horror author Geoff Cooper, and play a prominent role in Keene and Cooper’s novel Shades. LeHorn’s Hollow is a major setting in Keene’s works, such as “Red Wood,” Dark Hollow, and Ghost Walk. “Homo superior” is a term first used to describe superhumans in Olaf Stapledon’s novel Odd John, and later in other works such as Marvel Comics’ X-Men titles (as a scientific designation for mutants) and the television series Babylon 5; at least two Marvel Comics mutants, Piotr “Colossus” Rasputin and Illyana “Magik” Rasputina, are also descendants of Rasputin; although the X-Men’s stories do not fit into CU continuity, the CU obviously has a mutant descendant of the Mad Monk among its inhabitants as well. The murdered girl is implied to be a victim of The Exit, a serial killer from Keene’s stories “I Am an Exit” and “This is Not an Exit,” who murders people at highway exits. I wonder how this fits in with the sorcerer Rasputin from the Hellboy comics. Rasputin was the also the son of Moriarty and battled the Shadow as noted in the first volume of Crossovers. I seem to remember Rasputin being a vampire in an episode of Forever Knight. I believe there is some connection of Forever Knight to the CU? Something from a Kolchak the Night Stalker short story? Of course, if you read about Rasputin's death were he showed he was really hard to kill, you do have to wonder if he was a mutant or something. Stuart M. Kaminsky's "The Night Talker" has Kolchak battling Ettiene Rembeau (aka Terry Donlan), a vampire who poses as a late night radio personality, which was also Lucien LaCroix's MO on FOREVER KNIGHT. It's possible that Rembeau and LaCroix are the same character. That's probably what I was thinking about. The various different versions of Rasputin probably could be interpreted as something supernatural but undefinable about the person.